Real Madrid’s Sergio Ramos and Barcelona’s Gerard Pique‘s rivalry is far from over, not in the nearest future. The pair renewed their feud during last night’s el-clasico which ended 3-2 in favour of Barcelona, thanks to a late strike by Lionel Messi. Ramos was banded a red card at the 77th minute after an attempted two-footed tackle on Messi; his 5th red card in the fixture and 22nd in his entire career. 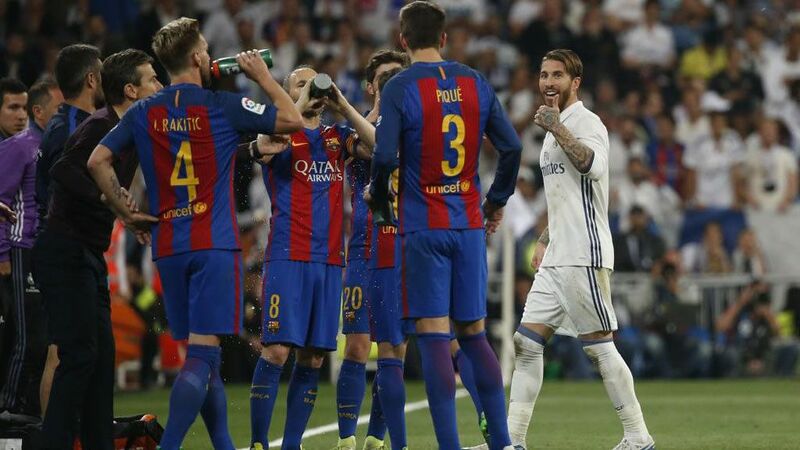 As Ramos was leaving the pitch, he sarcastically clapped at his arch enemy, uttering some unclear words which seemed to suggest that that the war was far from over. Paul Pogba’s dab used to teach maths.